We're impressed with this power amp. It's not flashy but it does its job well. Sturdily built despite compact 1U frame. Good sound quality. Overload protection. Noisy fan. Can get hot. 9.5kg is still a fair amount of weight. If you're a live musician looking to construct a gigging rig, you're faced with choices when it comes to amplification. There are plenty of powered monitor solutions, or you might prefer a separate amplification and speaker system set-up. If you fall into the latter camp and you're spec'ing up a medium sized rig, the Gear4Music AA500BX may well be of interest. Its name is a little confusing as the AA500BX is actually an amp capable of producing 750W at peak power. 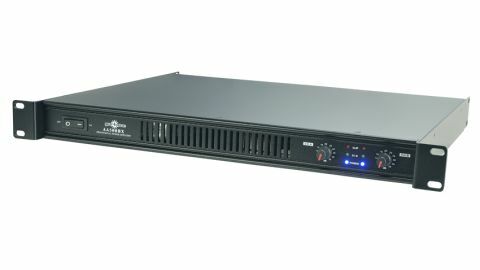 It's a compact bit of kit, squeezing its sturdily built frame into a single (1U) slot of rack space. It also manages to keep its weight down to 9.5kg, which is fairly low by many of its competitors' standards, so it's an impressively unassuming piece of kit. The AA500BX front panel is relatively sparse. On the far left-hand side, you'll find the power rocker switch, whilst the central section of the front panel is taken up with ventilation holes, which the manual warns you not to cover to prevent overheating. Part of the internal construction includes a variable-speed fan, which will increase in power under particularly hot conditions. It's worth noting that this is noisy, even when switching the unit on from cold. On the right-hand side, pleasingly sturdy rotary dials provide independent level balance for the left- and right-hand sides. Three-stage LED ladders provide monitoring of power and level input with 'power' in blue, 'signal' in green and 'clip' in red if you crank levels too high. Round the back, each channel features a trio of input options, with electronically balanced XLR, 1/4" jack and RCA input connectors. Collectively, these facilitate input from a wide range of possible sources. There are also options when it comes to output connectors to your speakers of choice, with both red/black binding post speaker ports or high-grade Speakon connections. Elsewhere on the back panel, you'll find the power input source and more ventilation ports. Lastly, there's a rocker switch to enable or bypass the internal clip limiter function, which has the job of preventing internal signal overload. Indeed, the AA500BX also features DC protection, short circuit protection, thermal protection and overload protection, all of which provide some reassurance that this is an amp determined to live up to your expectations. And broadly speaking, it does. It's not flashy, but when pressed into service, the Gear4Music 750W AA500BX Power Amp does exactly what you'd want it to: provide a good quality sound with enough versatility to accommodate the needs of differing venues. If you're looking for a relatively lightweight but well-built amplifier for your live rig and don't want to break the bank, we'd definitely suggest adding the AA500BX to your list of 'must try' options.